A well-written landing page can be worth $1 million and drive conversions up by as much as 500%. Send your new clients welcome emails and ask them for feedback: you’ll see click-through rates of over 40% for a single, essential message. You’ve got a great product and/or service. You know what your potential clients want. You have achieved that delicate and ever-elusive balance of Product/Market Fit. Even your traffic stats are good. And still, for some reason, your conversion rates are tanking. You do understand that not all traffic converts into leads and sales, simply because not all your visitors are interested in what you’re trying to sell them. Your conversion rate is a meagre 3 per cent (or less). This is frustrating. At this rate you’ll be going out of business quick. But you’ve been working so hard, trying to get this right. What can you do? The solution might not seem immediately apparent. After all, you’ve been improving your page design and UX for a long time now and are running out of ideas. And still, the one thing that can save your business from tanking is right under your nose. They look for markers of good, creditable content. Users will make a lot of compromises, for the sake of greatly written content. They’ll even turn a blind eye to poor(-ish) design and a lot of on-page advertising. They scan and skim, rather than actually read. As CrazyEgg has shown us all, users intuitively look for anchor points to set their eyes on, on any given page. They seek instant gratification. This is an often encountered notion in marketing. Users visit specific pages to have specific expectations met. Fail to do that and watch your bounce rate explode through the roof. Their browsing is never linear. Web users actively seek out links that would seem to provide the answers to the questions they arrived at the site with. Give them a link to click on and they’ll go for it. Combined with their tendency toward instant gratification, this gives rise to the option of satisficing (which works immediately and responds intuitively to the users’ demands), rather than optimizing (which offers results for the longer term, but is also more strenuous to implement). They want to feel in control. They don’t like unexpected pop-up windows. They do like what they’re already familiar with, like being able to navigate back to a previous page by clicking the ‘back’ button. From all of the above, a set of key principles behind effective landing page copywriting emerge. Keep it simple. Seriously. Users hate cutesy brand names, pompous words, bolded and italicized content, and anything over-promotional. In a nutshell, the harder you try to sell them something, the quicker they’ll be onto you and out of there. Get to the point. What do you want the user to do? That’s exactly what you should be telling them. ‘Sign up now’ and ‘Click here to buy’ never went out of style, really. Provide objective arguments for your product/service. How could the user benefit from what you’re trying to sell them? Tell them about it, in simple, concise, logical sentences. Organize your content. Provide your users with anchors to rest their eyes on. Use subheadings at several levels, lists (like this one!) and break up bulky chunks of text into readable paragraphs. Why do all of the above? Because a well-written landing page can literally be worth $1 million and bring you a whopping 500% raise in conversion rates. The guys at Groove HQ were desperate to see that their product was failing, even in spite of massive efforts to create a great website. Their conversion rate was a meagre 2.3%, so something was clearly wrong with it. They went out and tried to solve the problem. After the fact, they created this handy case study of their woes and how they got over them. 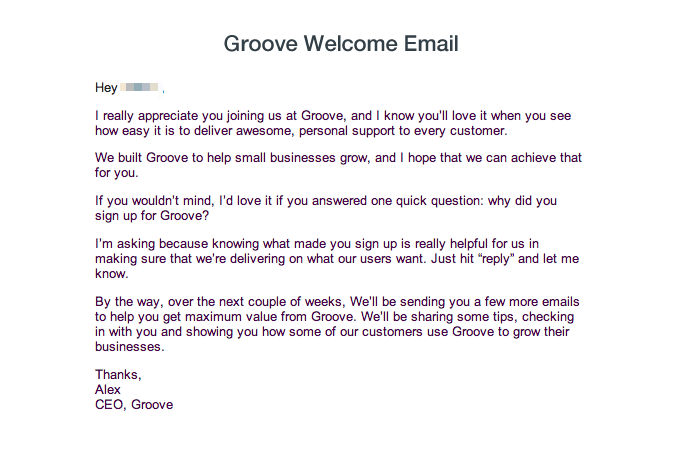 One thing Groove HQ did was to talk to the experts. They enlisted the aid of 3 optimization bloggers, with a combined monthly readership of 200,000, two well-known ‘growth hacking’ marketers, plus the CEO of a landing agency. The feedback they got on their customer support SaaS landing page was harsh. Above, an old, failed headline that Groove was using. The expert response: why try to convince a potential client to set something up, when they know nothing about what that product can do for them? The lesson they learned in the process is that they were trying to do all the ‘right marketing things’ and, in the process, ignoring their clients completely. In other words, they were speaking biz speak, but failing to talk to the people in actual, relatable, empathetic human language. Talk like your clients, the experts told them. And that’s exactly what they started doing next. First, they talked to the old clients. They identified their power users, who, according to KISSMetrics, got over 40 emails from them per week, and who also responded to them. Then, they engaged in qualitative research with them. This strictly comprised live, one-on-one interviews with open-ended questions. What they got out of it was a lot of insight, plus some ideas for their new communication strategy. Then, they approached new sign-ups. This effort was not driven by the desire to convert, but by the need to converse. They wanted to know what brought these potential leads to the website, what they are looking for in the service, and get all the insight out of it that they could. The results: a 41% response rate and a ton of innovative ideas, which also helped with the eventual content-centred redesign of the site. Once they got a hold of all that valuable information, all that the guys at Groove had to do was to put it all into amazing website copy. They would pour it all into a format that emphasized value, both as far as the content quality goes, as well as in terms of what the company’s products could do for users. The end results speak for themselves: the site’s conversion rates nearly doubled—from 2.3% to 4.3%. CrazyEgg. You will want to know what works and what doesn’t, with your current design. There’s no other tool out there that can give you better insight than this one. YouTube. Yup, that’s right: the world’s biggest video sharing platform is an invaluable resource in this process. You see, content means far more than written words on the page. Adding interactive, playable elements, like a customer testimonial in video format would give you a great edge over your competitors. Embedding YouTube videos nowadays is ridiculously easy, too. Balsamiq. You’ll want an interface that’s intuitive, UX-optimized, simple, and user-friendly. Balsamiq allows you to play around with a ton of elements, figure out what works best for you, create website and page mock-ups and come up with amazing sites. Optimizely. Remember when we told you earlier that optimization never really ends? We weren’t kidding about that. You will need an A/B testing tool, and the one from Optimizely is definitely the one with the best value on the market right now. Qualaroo. Obviously, a 100% conversion rate is not an achievable goal. However, the visitors that don’t convert can still provide you with great insight. Ask them questions via Qualaroo and see what you can improve on.